Over the past several weeks I’ve been giving a slow and thoughtful read to George Marsden’s Reforming Fundamentalism: Fuller Seminary and the New Evangelicalism (Eerdmans 1987), which is a history of the controversial first two decades of Fuller Theological Seminary (1947-1967), written with a special view as to how this history interfaces with the larger story of evangelicalism. With the epilogue, sequel, and appendix, Marsden also fills out much of Fuller’s later history, up till the time of the book’s publication (1987), which sheds further light upon the significance of the early years. Its a fascinating book, well-researched and well-written, with thoughtful analysis and challenging implications. For me, the main benefit of the book was simply to learn more about evangelicalism. The events at Fuller (hereafter FTS) provide a helpful window through which to see the larger evangelical landscape, and Marsden does a great job telling the story and making the connections. Over the next several posts I am going to publish 12 insights that I will take away from the book. Here are my first 2. 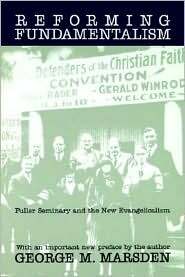 One of Marsden’s main arguments, evident in book’s title, is that evangelicalism and fundamentalism were not yet clearly distinct movements when FTS was founded in 1947. As Carl Henry put it, “in the 1930’s we were all fundamentalists” (quoted on p. 10). As early as 1942 the seeds of separation were present, with the founding of the National Association of Evangelicals (NAE) under the leadership of Harold John Ockenga as distinct from the American Council of Christian Church (ACCC) under the leadership of Carl McIntire. Nevertheless, evangelicalism was not yet viewed as a separate entity, but rather as a reform movement within fundamentalism. The definitive split became apparent by the mid/late 1950’s with the founding of Christianity Today in 1956, Billy Graham’s disassociation with his earlier fundamentalist supporters during his spring 1957 New York crusade, and Harold John Ockenga’s December 1957 press release distinguishing “neo-evangelicalism” from liberalism, neo-orthodoxy, and fundamentalism. Prior to this, the terms evangelicalism and fundamentalism had different connotations and represented different leanings, but did not refer to two separate groups. Its interesting to note, for example, that such fundamentalists as Bob Jones, Sr. and John R. Rice were originally part of the NAE, along with Ockenga, Charles Fuller, and others. The differences that would emerge between them had not yet crystallized. Thus FTS at its founding could properly be called a “fundamentalist” school, and had in its early years several stereotypically “fundamentalist” faculty members, such as Wilber Smith and Charles Woodbridge. As Marsden says of the founding of FTS, “the unmistakable intention was, not a break from fundamentalism, but a reform from within” (3). My thought: to what extent do different leanings and emphases within contemporary evangelicalism foreshadow more definitive splits further down the road, just as the different leanings of those associated with FTS and those more squarely in the fundamentalist camp eventually erupted into a clear split? Since evangelicalism is a multi-generational movement, like the Puritan effort, and since it already has a history of fragmentation, I wonder how we can prepare for our future by looking back at our origins. And as we see the seeds of further disintegration, how can we re-center ourselves around the gospel alone? To what extent should we seek to regather all who claim the name evangelical, and to what extent must new lines of identity be drawn? 2) The issue of separatism: when to divide? Marsden highlights the significance of the question of when to separate from particular churches and denominations and institutions and shows how important this question was for the developing identity of evangelicalism as distinct from fundamentalism (e.g., pp. 6-7, 36-38, 41-44, 63-67). Since fidelity to the gospel requires both separation from apostasy and some degree of willingness to work within differences, the issue becomes, where do we draw the lines? How much difference of conviction is acceptable? When should we form new institutions and denominations, and when should we stay in the old institutions and denomination and seek to be an agent of reform among them? Evangelicals and fundamentalists answered these questions differently, with the latter being less willing to associate with those who remained in the mainline denominations. It seems to me, however, that separatism was not only a dividing issue between evangelicalism and fundamentalism, but also within evangelicalism, as in, e.g., the Stott vs. Lloyd-Jones controversy in 1967, or Machen’s loss of support even among conservatives during his struggle with the Presbyterian church over missions in 1933-1936. How much should we separate? is a question that has divided even very close allies. Reforming Fundamentalism highlights the dangers not only of a “cooperation at all costs” mentality which almost never separates, but also of a knee-jerk separatism which separates too quickly. An example of this latter error, in my opinion, would be what Marsden calls “second-degree separationism,” i.e., the disassociation of some fundamentalists not only from liberals but also from conservatives and moderates who themselves do not separate from liberals (cf. 286ff.). When this mentality takes over, the question shifts from “what does he believe?” to “whom does he hang out with?” and anyone can become suspicious at any time. In extreme forms, this tendency can become cultic and abusive. When do we pull away? When do we stay and fight? It seems to me that our history teaches us to answer these questions very, very carefully, for great minds have been divided over them and the errors in both directions have proven dangerous.